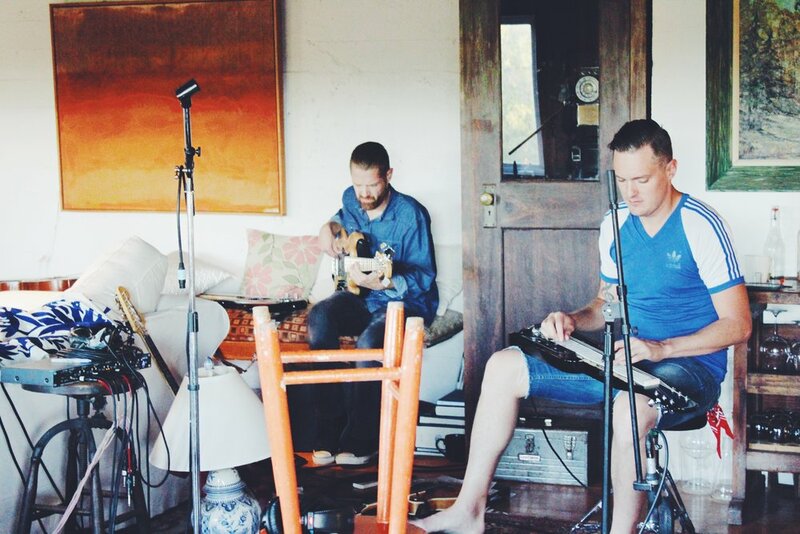 When asked about the inspiration for their new album, recorded in the hills of Topanga Canyon, the members of Denver-based Dragondeer, all describe a similarly surreal scene. Each mined solace from the bucolic, unfamiliar surroundings, which, according to bassist Casey Sidwell was, “somehow soothing and creepy all at once.” From the opening soul-dirge title track of If You Got the Blues, the debut full length album from Dragondeer, the effect of the atmosphere is prominent. This spacious, blues epic comes out of the gate with a whisper that has as much place on the Sandlot soundtrack as it does in an LA afterhours bar. “It's a love song,” says frontman Eric Halborg of the title track, “a song that I felt gut punched in such a good way each time we played it back during the sessions.” It has all the familiarity of a love song but is delivered with an earnestness and honesty that makes it, by virtue, singular. Blasting into the aptly titled “Amarillo Bump,” which starts like CCR’s “Run Through the Jungle”, the album begins to flex the diversity that it displays throughout its course. The integrity of the musicians, with a total lack of cynicism, makes the music heart wrenching and entirely believable. The confident restraint of the rhythm section, featuring Sidwell and Carl Sorensen (drums), slinks through the album with the virtuosity of old hands and remains committed to authentically interpreting the music that this album draws its inspiration from. String savant, Cole Rudy, provides the texture this record hangs its sonic hat on. Switching gears between sinister, ethereal, funky, and down home, evident in his work on songs like “Won’t Back Down” and “Same Train”. Out front, the chronically smooth voice of Eric Halborg ties the album together with occasional help from his blistering blues harp. The anthemic “Broadway Avenue” showcases his penchant for melding a beach attitude with the griminess of the blues. Listened to as a whole, the album plays like a blend of stoner ethos, Dr. Hook-esque country-funk, and psychonaut blues. Perhaps the biggest influence on the album, however, was esteemed producer, Mark Howard, whose resume reads like a record nerd’s inventory list. Bob Dylan, Tom Waits, REM, Neil Young, Lucinda Williams are just a few among a bevy of legendary recording artists he has called clients. Halborg notes, succinctly, “Mark Howard is a master who has worked with masters.” His mastery is on obvious display across “If You’ve Got the Blues,” with a deft use of space, and a supreme talent for finding the performance. American music, with the blues in particular, has been interpreted, replicated, and regurgitated in almost every conceivable fashion, which makes it all the more compelling when a new unique incarnation comes along. Culled from the vestiges of some of the most important bands Colorado has ever produced, Dragondeer has conjured a singular and neoteric sound that both nods to the past and eschews fears of modern influence. They draw from all corners of the American sound including the vicious edges of Elmore James, the hypnotic repetition of Junior Kimbrough, the wailing harmonica of Sonny Boy Williamson, and the smooth psychedelia of Taj Mahal. Paired with pieces of Sly Stone, Captain Beefheart, the longform leanings of the hippie revolution a la The Grateful Dead, and the agony of American soul music, these influences have helped Dragondeer carve a niche at a crossroads of music that has remained largely unexplored. “If You’ve Got the Blues” is a testament to Dragondeer’s songwriting, musicianship, and purity. It’s also a personal manifesto for the band, whose belief in a shared human experience and desire to connect with everyone, gives the record an empathetic slant that’s almost entirely un-echoed in this self-serving, narcissistic modern landscape. “It's about sticking by your loved ones and being there for 'em when they need it; rising up your tribe,” says Halborg. “We try to do that for each other and those around us so it felt right to name the record in honor of that notion.” Every bit as compelling as it is contemplative, and frenetic as it is mollifying, this is a band, and an album, that explores the American experience with eyes to both ends of the spectrum of the human heart. The band has performed all over the United States and abroad with performance slots at festivals including: Telluride Blues & Brews Festival, Nacarubi Music Festival in Big Sur, California, Tour De Fat, South Park Music Festival, SXSW 2014-2015, The Denver Post Underground Music Showcase (The UMS), Jazz Aspen Snowmass Festival, T-Bois Blues Festival in Louisiana, Arise Music Festival, The 24th Annual Grolsch Blues Festival in Schöppingen, Germany, and an appearance at the legendary Red Rocks Amphitheater. "Dragondeer is great for day drinking and fishing next to the swamp while gators sunbathe near you and your ex-boyfriend is blowing up your phone with angry texts you’re ignoring in between pulls of whiskey. It’s music for wandering down South Broadway in the summer, sticky with sweat, searching for the nearest party. Really, though, it’s bluesy and forceful, and you’ll wonder why you don’t have Dragondeer in heavy rotation after hearing Eric Halborg’s vocal chops." "Nestled somewhere between the quicksilver psychedelia of the '60s and bone-thumpin' blues from Mississippi's yesteryear, these Colorado cats have crafted a sound that is equal parts cosmic and grooving"